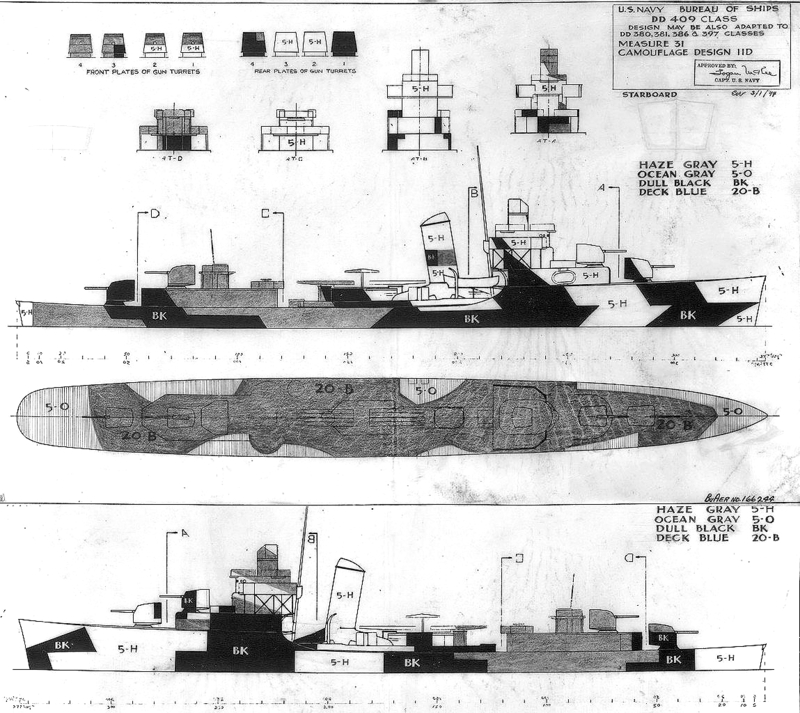 The drawing for Design 31/11D dated March 1, 1944, for the Sims class destroyers, but was also used by some Benham class destroyers. The specified vertical colors were Measure 31: dull black (BK), ocean gray (5-O) and haze gray (5-H). Measure 32 would substitute light gray (5-L) for haze gray. The first drawing for Design 11D was attached to the July 15, 1943, memo to PacFleet for Benson class. This design was drawn up for the Buckley class destroyer escorts on December 22, 1943. 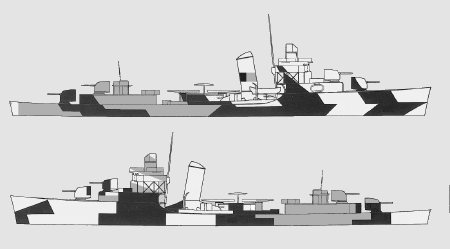 This design for the Buckley destroyer escorts had its patterns almost reversed port and starboard to generate the patterns for both Fletcher and Sims in March 1944; the prominent panel of the Fletcher port bow was on the Buckley starboard bow. An “experimental” version of this design was also sent to the battleship USS Indiana (BB-58) on September 16, 1943, and worn by her by October. Original drawing source: NARA 80-G-166244 and 80-G-166245.